University of Maryland Police have charged 22-year-old Sean Urbanski with murder. The FBI is investigating whether the stabbing was a hate crime. A white University of Maryland student was charged Sunday with stabbing a black newly commissioned US Army lieutenant to death. Authorities said Sunday that they are now evaluating whether the incident was a possible hate crime. University of Maryland police charged 22-year-old Sean Christopher Urbanski, of Severna Park, Maryland, with first- and second-degree murder and first-degree assault after Army Lt. Richard Collins III was stabbed and killed early Saturday morning in what authorities called a "totally unprovoked" attack. The evaluation of whether it was a possible hate crime stems from Urbanski's involvement in a Facebook group called "Alt Reich: Nation," police said Sunday. University Police Chief David B. Mitchell said he asked the FBI for help in the case after discovering the online group. Urbanski was held on a no-bond status on Monday at a hearing where his parents were present to support him. "We believe he is a dangerous person who stabbed a perfect stranger at a bus stop," Prince George's County State's Attorney, Angela Alsobrooks, told reporters Monday. "He is threat to the community," she said. But at another news conference late Monday, Alsobrooks said Urbanski's motive remains unclear. “We do not have enough evidence to say conclusively whether this is a hate crime,” she said. “What we can say is that we will leave no stone unturned.” She added that authorities "need something probably more than just a Facebook posting" to determine that the killing was a hate crime. The stabbing occurred at around 3 a.m. Saturday morning, as Collins and two others were waiting for an Uber near the University of Maryland's Montgomery Hall, police said. Collins, a 23-year-old student at Bowie State University, was visiting friends at the College Park campus, and he and his two companions watched as Urbanski, who was unknown to them, approached. Mitchell said Urbanski was "yelling, perhaps screaming" as he approached them, according to eyewitnesses. He appeared to be intoxicated, Mitchell said, adding that they were testing his blood to determine the use of other drugs as well. According to Mitchell, Urbanski told Collins: "Step left, step left if you know what’s best for you.” When a puzzled Collins said no, Mitchell said, Urbanski stabbed him in the chest and fled, police said. Collins died at the hospital. 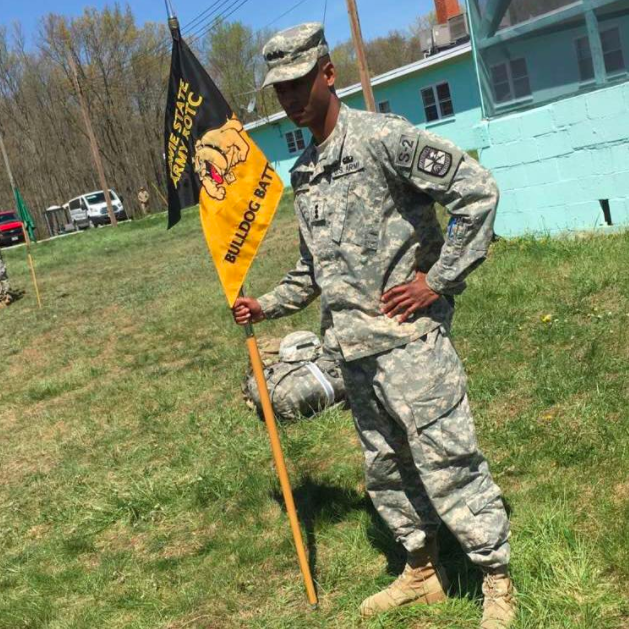 The victim was due to graduate from Bowie State with a business administration degree on Tuesday and was recently commissioned as a second lieutenant in the US Army's intelligence division. Prince George's County Police arrested Urbanski shortly after the incident, while he was seated on a bench at a bus stop about 50 feet from the attack. Witnesses, including Collins' friends, identified Urbanski as the assailant, and police said they recovered a folding knife in his front pocket. The incident was also captured on surveillance cameras. Gordon Johnson, the FBI agent from the Baltimore field office, said that they would make a "final determination" of whether it was a hate crime after the homicide investigation was completed and they had "looked at the evidence in totality." "We're going to evaluate that as an ongoing concern with respect to whether this was a hate crime or not," Johnson said. Though Urbanski's Facebook page is now private, screenshots circulating on social media appear to confirm that he belonged to the "Alt Reich: Nation" group. By Sunday, the group's page had been taken down, but an archived snapshot showed that it was created in March and had about 1,150 members. The description for the group reads: "Controversial humor. Memes." Several posts display racist memes and offensive content about women. Alex Goodman, an administrator for Alt Reich: Nation, confirmed to BuzzFeed News that the group's page had been taken down on Sunday, and described it as a meme and satire platform. A 2013 graduate of Severna Park High School who made the honor roll his junior year, Urbanski started as a freshman at the University of Maryland's engineering school but left in 2014, according to a LinkedIn profile. The LinkedIn page, which has now been removed, shows that he returned to the University of Maryland last year, after a stint at Anne Arundel Community College, and was set to graduate in 2018 with a degree in kinesiology. Severna Park Lanes, a bowling alley that Urbanski listed as a current employer on his LinkedIn Page, told BuzzFeed News that he had not worked there in more than a year. The business declined further comment. “He wasn’t a violent person in school. He was what we would call ‘normal,’ wasn’t popular but wasn’t an outcast, either,” Darrian Johnson, one of Urbanski's high school classmates, told the Washington Post. Urbanski's mother, Elizabeth, works for the University of Maryland as the associate director of financial aid, according to LinkedIn. University of Maryland Police Chief David Mitchell (center) with Gordon Johnson, FBI special agent in charge of the Baltimore Field Office (left), and Prince George's County Police Chief Henry Stawinski III. The day before he was killed, Collins changed his Facebook profile picture to a new one of him in his uniform. 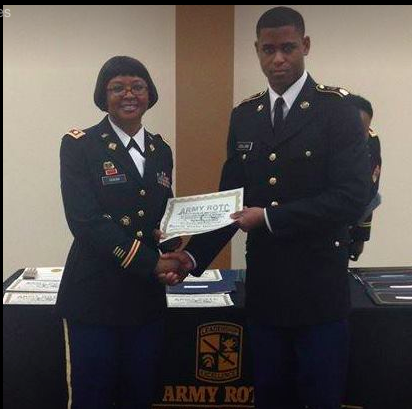 Other Facebook photos show him proudly displaying ROTC awards and certificates. Rev. Darryl L. Godlock, a spokesman for the Collins family, told the Baltimore Sun that the soon-to-be college graduate wanted to follow in the footsteps of his father, a military veteran. "He wanted to make his parents proud of him so he went into the military to serve his country," Godlock said. "It was a great opportunity for him to advance forward and make the most out of his career." Bowie State University has planned a vigil for Collins on Monday. “Hate has no place in America. Hate has no place on a college campus where young minds are coming together to try to change the world. They can’t change the world if they are not here,” Artie L. Travis, vice president for student affairs at Bowie State, said Sunday. In another statement, University of Maryland President Wallace D. Loh said the school was "shocked, saddened, and angered" by the "horrific assault." "We must all do more to nurture a climate — on campus and beyond — where we stand against hate, we fight against hate crimes, and we reaffirm the values that define us a university and as a democracy," Loh said. "As we search for answers to this senseless crime, please continue to keep the family and friends of Lt. Collins, and the BSU community, in your thoughts and prayers. We all grieve together for a promising life ended far too early."